Australia's National 'Ride to Work' day was on Wednesday of last week. 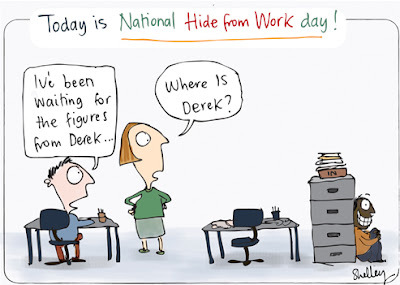 So I decided to name this Monday our National 'Hide from Work' day. As a freelance cartoonist, I mostly work alone in cafes so 'Hide from Work' day didn't really work for me. None of my editors noticed I was gone. Annoyingly, the waitresses kept on peering under the table and asking if I was ok. I really like the comic of the neglected gut. 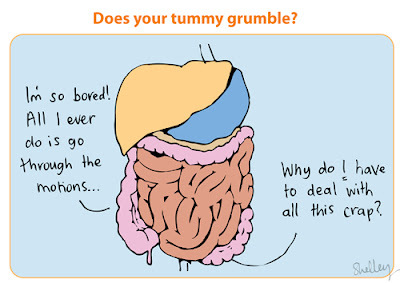 We always talk about eating for the heart/cholesterol/brain/bone health, but we often forget to eat for the gut health!